Posted on 05 April 2015. 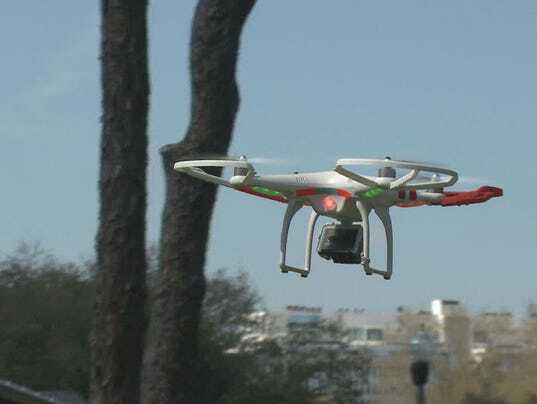 Tallahassee, Florida -- A law that would make it illegal to use a drone to spy on your family is moving through the Florida Legislature right now. Under the proposed law, the government and police would be forbidden from using drones for surveillance, and so would everyday people like your neighbors. The ban would only apply to private property and only to places where someone has "a reasonable expectation of privacy." So, if you're out in your front yard, a drone pilot could take all of the pictures they want. But if you're behind your fence or in your house, you could sue someone who takes pictures of your family. It's already illegal in Florida for law enforcement to gather evidence for court with a drone. But they can still watch you like a hawk using a hovering drone. This bill would shut that down. In the bill (SB 766 in the Senate and its similar House partner HB 649), there are exceptions for emergencies like terrorist threats or searches for missing people. You could also still use a drone in private places if you have written permission or a warrant. A law that would make it illegal to use a drone to spy on your family is moving through the Florida Legislature right now. I talked to the head of the Tampa Bay ACLU chapter, Mike Pheneger. He told me in general, he likes the bill -- particularly the limits on law enforcement -- however, extending the ban past the police to private citizens makes him anxious. But the state senator who wrote the bill told me Florida needs to get out in front of this, before drones go from hobby to harassment. "I don't want to be sitting in my living room, and having a drove hovering outside my window," State Sen. Dorothy Hukill, a Republican from the Daytona Beach area, said. "The law, as it stands now, does not stop it." "Your neighbor can't walk onto your property without your permission. Why should they be able to film you? Follow you around? That's pretty scary. Why would somebody do that?" The FAA lets anyone fly drones for fun, as long as they meet some basic requirements. In the Tampa Bay area, only one local law enforcement agency has the FAA's approval to use a drone. I asked that agency, the Polk County Sheriff's Office, what a drone surveillance ban would mean for them. Spokeswoman Donna Wood told me so far, they "have used the equipment in SWAT callout situations to increase [deputy] safety." So a ban on drone surveillance would not affect what they are doing with drones right now.